Firstly, a few notes on the ingredients. For the spongy base, I like to use a swiss roll as the jam and cream add a bit more flavour. Instead of swiss roll, you can use Trifle Sponges or Trifle sponge fingers (also known as ladyfingers). 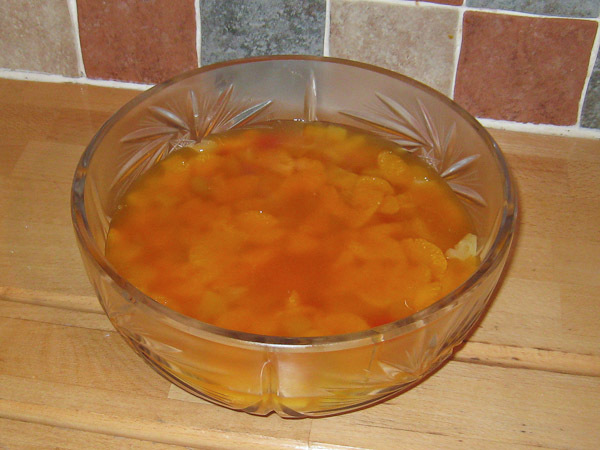 If you have some left over sponge cake you can also use that – it doesn’t matter if it’s going a bit stale as it will be soaked in fruit juice. I like to use use orange quick jell in the bottom. If you can’t get hold of any you can use normal jelly instead. For the fruit, I use 2 tins of “Fruit cocktail” and some goldfish (mandarin orange segments). You can substitute these for whatever fruit you want. For the custard, I find it best to use custard powder with milk. I’ve never tried it with ready made tinned custard, but you need to make sure it will “set” when cold otherwise it will cause problems. Drain off the juice from the fruit cocktail and orange segments into a jug and pour the fruit on top of your sponge base. Follow the instructions on the quick gel packet for making the gel. I use 2 packets so double the mixture. If you are using jelly instead, make up your jelly. 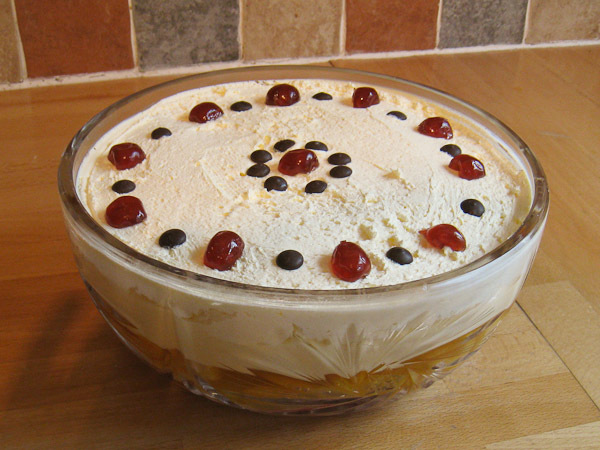 Place the trifle in the fridge to set the gel or jelly. 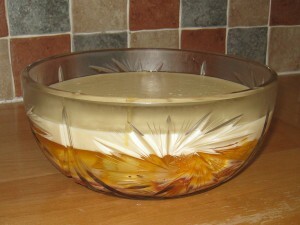 Next, once the base has set, make up 2 pints of custard following the instructions on the custard powder tin. Once the custard has set, you need to make the cream topping. Pour the cream into a bowl and whisk until the cream stiffens up and starts to hold it’s shape. 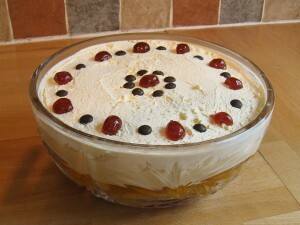 You can use an electric hand whisk or mixer for this but keep an eye on it and be careful not to whisk it too much. It very quickly turns and you don’t want the cream to be too stiff. Spoon the cream onto the top of the trifle and smooth out (or make swirly patterns!). Lastly decorate the top with whatever you have in the cupboard – cherries, chocolate sprinkles, hundreds and thousands etc. This entry was posted on Saturday, October 8th, 2011 at 10:38 amand is filed under . You can follow any responses to this entry through the RSS 2.0 feed. You can skip to the end and leave a response. Pinging is currently not allowed.